As I’m writing this, it’s a beautiful spring day, and I’m on my balcony with a cup of coffee and an Agatha Christie novel. Hard to beat that for my idea of a perfect day off. Reading an Agatha Christie is always a treat, and I recently went wild at Turtle Creek Books, where they have a display stand of old Agatha Christie paperbacks, some editions of which even had ads! I’m a sucker for old books and for Agatha Christie, so you can imagine the self-control it took to leave that store with only two Christies. I’ve always been much more of a Poirot than a Marple fan, and to be honest, haven’t even read a Tommy and Tuppence novel yet. What kind of Christie fan am I, eh? New book pledge for 2012: try a Tommy and Tuppence mystery. In the meantime, however, I still have quite a few Marples to catch up on, and one of them is the classic 4:50 from Paddington. As you may already know, I’m a total sucker for book design, and a major, major fan of the new Agatha Christie paperbacks from Harper Collins. Isn’t that cover just beautiful? My bookshelf has a mix of old, practically falling apart Agatha Christies that I couldn’t resist getting at second hand bookshops, and these beautiful Harper Collins paperbacks, which I also can’t resist just because they’re so pretty. In 4:50 from Paddington, elderly lady Mrs. Elspeth McGillicuddy is on the train from Paddington when another train passes, going in the opposite direction. At one point, Elspeth’s window lines up with one of the windows of the other train, and she witnesses a man strangling a woman. She immediately reports it to the train staff, but when police check the other train, they fail to find a corpse. Who is the victim, who is the killer, and more importantly, where is the body? No one believes that Elspeth has even seen anything at all, except for Miss Marple, who knows that while elderly ladies may have a tendency to imagine things, Elspeth is not that type of elderly lady at all. “I’m too old for any more adventures,” Miss Marple muses, just as she realizes how the murderer could have gotten rid of the body. It’s a brilliant idea, and in classic Christie fashion, we aren’t treated to it just yet. But we do know that, despite her age and inability to run around interrogating suspects, Miss Marple is definitely on the case! She enlists the help of Lucy Eyelesbarrow, an almost frighteningly efficient housekeeper who is like a younger, feistier version of Hercule Poirot’s secretary Miss Lemon. Upon Miss Marple’s instructions, Lucy finds employment in the Crackenthorpe household, with their house located close to the train’s route. This sets off the wonderfully convoluted, twisty, surprising Christie plot we’ve all come to love. With all the Christies I’ve read, you’d think I’d have become used to her surprising plot twists by now. Not the case with this book. I literally gasped out loud at a startling revelation midway through the story. I was also a hundred percent sure I knew who the murderer was by the halfway point, only to be completely proven wrong in the final pages. So much for my detective skills. And bravo to Agatha Christie, for keeping even an avid fan in the dark. One of my favourite things about Agatha Christie mysteries, other than the actual mystery, of course, is the characterization. 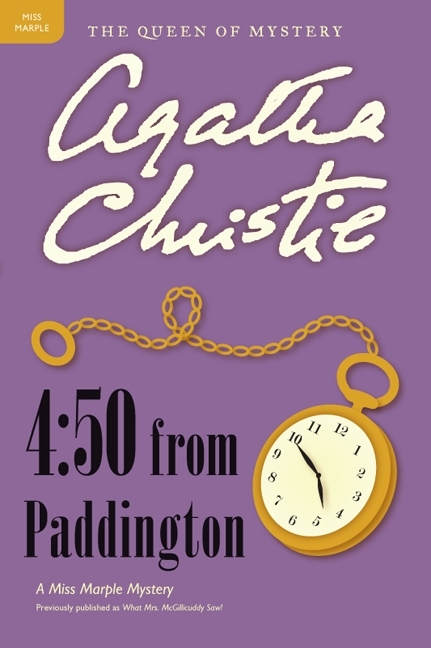 So many Christie mysteries are also comedies of manner, and the Crackenthorpe drama in 4:50 from Paddington totally drew me in. I love seeing Miss Marple play matchmaker — despite never having married, she is clearly a romantic at heart, and her knowing little smiles give her prediction the weight of years of observation. As Lucy exclaims after Miss Marple guesses some men in love with her, at a different time, Miss Marple would have been considered a witch for all the things she knew. “I suppose you think of everything!” said Lucy bitterly. This entry was posted in Book Reviews and tagged 50BookPledge2012, Fiction, Harper Collins, Mystery by Jaclyn. Bookmark the permalink.